There are a lot of different models for commercial and residential gates on the market, and they can be made from a variety of materials. While some more exotic types are made from different materials, the most common ones you’re likely to find are listed below. Timber has been used to make fences and doors for thousands of years, and remains a viable option even in the high tech world of today. Wooden gates can be incredibly strong, as well as aesthetically pleasing, but they’re also vulnerable to rot and warping without yearly repainting. Depending on the type of wood, these systems can vary considerably in price, weight, and toughness. Most wooden gates also include an iron core, which increases their strength and durability, but also their weight and price. Aluminum is probably the most lightweight gate material in common use, and is strongly resistant to rust, warping, and other weathering effects, making it very low maintenance. The downside is that it’s also probably the weakest option when it comes to resisting brute force, making it more easily damaged by accidents and intruders than most options. Aluminum is an excellent choice if expense is a bigger concern than security. Like its wooden counterpart, a wrought iron gate can give your property a great aesthetic boost and a lot of curb appeal. Iron is also a very strong material, but also the heaviest option on the list. This means that wrought iron frames are typically built with plenty of empty space between the bars, so they might not be the best option if you value privacy more than aesthetic appeal. Iron can last a long time as long as you keep it painted and oiled to protect it from the elements. Keep in mind that heavier frames/panels will require a more powerful electric gate opener that will be capable of generating the necessary horsepower. 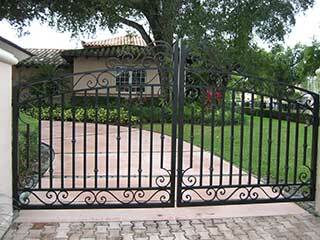 Steel gates are easily the strongest and most durable option, provided they’re properly taken care of. They are slightly lighter than iron ones, which means they can come in more styles. Steel gates can be expensive and difficult to install, but for sheer reliability it doesn’t get better than this material. Don't hesitate to get in touch with our team for more information.